However, the negativity surrounding It Happened One Night baffled audience members of its time and even today as the film went on to become a sleeper hit, was the first movie to win all five major Academy Awards, and has since gone on to become an acclaimed classic. Director Frank Capra proved that a mediocre script in the right hands could still become a timeless treasure. Passion Play writer/director Mitch Glazer, on the other hand, doesn’t have the same luck. Instead, Glazer proves that a mediocre script in the wrong hands can become nothing more than a pile of on-screen feces. Passion Play has star power, perhaps its only redeeming quality. Mickey Rourke, Bill Murray and Megan Fox all star as a trio trapped in an obsessive desperate co-dependency with one another. Rourke portrays Nathan Poole, a once famous trumpet player whose talent and health has fallen to the wayside due to his substance abuse. After sleeping with the wife of notorious crime boss Happy Shannon (Murray), Nate miraculously escapes his own death and stumbles upon a traveling circus where the main attraction is Lily, a beautifully mysterious girl with wings attached to her back. Enticed by Lily’s angelic, lonely and insecure persona Nathan strikes up a relationship with her until his paths cross with Happy once again. Stunned by Lily’s beauty Happy and Nate struggle to win her heart and keep Lily protected from those willing to take advantage of her innocence… you know, people like them. If you’re ever looking for films to watch that teach you how not to make a movie, then look no further than Passion Play… well that, The Roommate and Birdemic. Passion Play’s major flaw is the blatant careless mistakes it makes throughout. Edits don’t necessarily match well with one another resulting in awkward transitions between scenes and showcasing moments of bad overacting. Glazer’s visual eye is far from perfect and his decision to film on staged sets are more than obvious throughout, especially considering that he oddly edits these scenes against ones shot on location. The CGI effects for Lily’s wings are so lackluster that at times it’s utterly laughable at how cheap they appear. There is also little to no logic as to why Lily’s wings are constantly spread in her more relaxed and calmed states. Call me a realist but nothing in nature would justify why or how something with wings could survive this way. Plot devices are at times so over-the-top that even Glazer’s writing wasn’t sure as to how to explain them. Instead he allows characters to express their own disbelief at certain situations while never giving explanations. In one scene Lily’s father figure, Sam (Rhys Ifans), unexpectedly snaps threatening Nate’s life despite the fact that he possesses no immediate threat to Lily or Sam. Nate finds himself seconds from death until an unexpected event saves him. His rescue is so extravagant and illogical that I literally burst out laughing when it happened thinking his rescue was a dream sequence and being sorely disappointed that it wasn’t. While Mickey Rourke must be commended on his delivery during emotional scenes, the overall acting is subpar. Murray is suave as a the subdued but ruthless villain for about 10 minutes until alas his character becomes a one-note flat antagonist with no motivation except rage and mistrust. 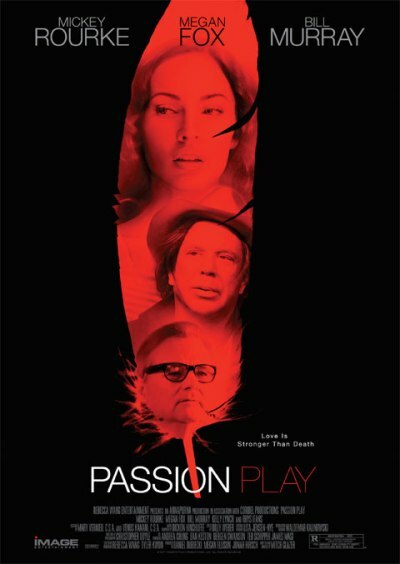 Passion Play tries desperately to deliver an enthralling performance from its lead actress, and at times almost seems as though it was written in order for Fox to show off her skills, regardless of the fact that she doesn’t really possess much. I admit it, I like Fox a lot… ok yes I have a girl crush on her, sue me. However, facts are facts: the woman is at best a subpar actress. She’s not terrible but she’s just not good. Fox has the Kristen Stewart factor; able to deliver lines and emotions convincingly but has repetitive quirks and mannerisms that remind viewers that the character being watched is merely an actor trying too hard. Stewart’s mannerisms consist of brushing her hair out of her eyes, biting her lip, and constantly donning a dazed unsure look on her face. Fox’s beauty causes her to constantly appear to be flirting; frequently tossing her hair, flashing a flirtatious fake smile and donning a hesitant guarded look. The minute her plastic smile quivers, audiences can predict that Lily will attempt to cry. If you can make it through the film and not feel insulted by the story, writing and filmmaking process, then don’t worry the ending is sure to slap even the most easy-going moviegoer in the face. The entire story of Passion Play is halfhearted and the film’s execution of such a ridiculous premise results in a trite and uninteresting movie that is only worth the watch because it’s badness will result in a few laugh out loud moments. Regardless of these LOL moments, I still wouldn’t recommend seeing Passion Play. There’s a reason it went straight to DVD and I’m pretty sure that reason was to have a coaster for a six-pack. AVOID IT. Every time someone watches this film an angel loses its wings.